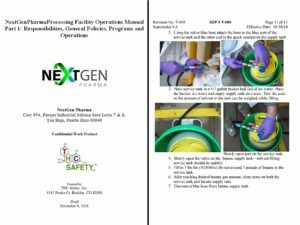 Operations Manual – THC Safety, Inc. In order to provide a reasonable targeted OP we will need to understand and have a clear listing of the client’s scope of operation. Based on the understanding, we provide the editable document template to the customer that will allow them to meet most regulatory and good practices requirements. Embedded in the documents is our intellectual property (IP). We expect that the clients will add their own more specific information where applicable to make the document site specific. If we are contracted to help with process optimization, all additions to the documents will be the client’s IP. 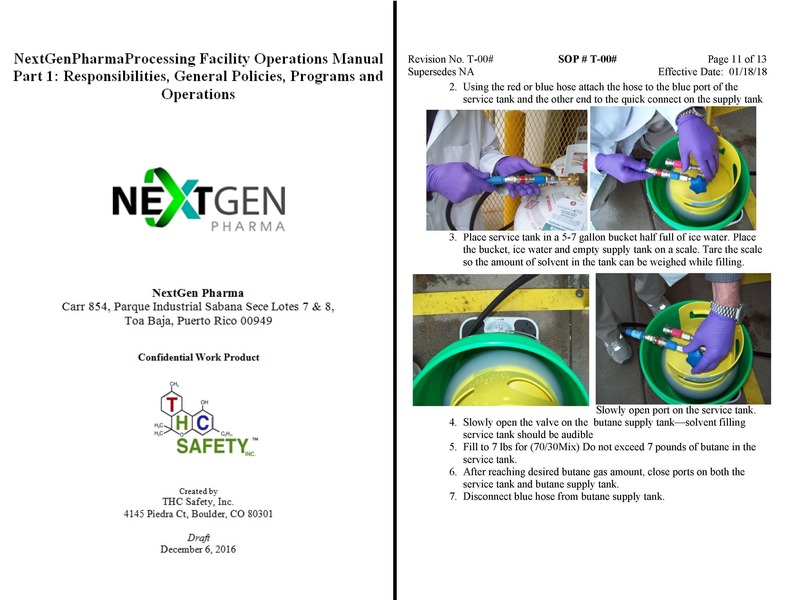 The processing facility operations manual is actually made up of five documents; Part 1: Facility, policy, responsibilities, program and overview of processing operations; Part 2: Guidelines; Part 3: Standard Operating Procedures; Part 4: Equipment; and Part 5: Forms and References. We expect most updates to affect the guidelines, SOPs and equipment sections. Supervisors should review at least the table of contents of the manual with new employees ASAP; followed by required trainings. Select the guidelines, SOPs and equipment to review with new employees that are appropriate for their job task to review in more detail. This document was designed to be electronically linked to other guidance and compliance plans. All processing employees who work at the client’s facility should be required to understand how to use the manual. They should refer to the document when they have a question concerning proper processing, extraction, safety and procedures questions. We expect that all processing employees will use the manual as a valuable reference document. This document is designed to assist with the safe production of medical & recreational cannabis concentrates; it requires employee to be trained. Classroom, off-site and On-the-job training will be required to fulfill requirements. Employees are NOT allowed to operate equipment they have not been trained and certified on.